Small financial institution’s payroll administrators exchange a lot of private data and files with other organizations, such as payroll providers. Administrators regularly need to send personal information like account, routing and social security numbers to their payroll service provider. The process is inefficient and expensive, due to the need to fax, mail or courier this private information – as well as the obligatory call to confirm the information arrived. DataMotion SecureMail integrates seamlessly with existing email clients, like Outlook, Lotus Notes and Groupwise, while enabling payroll administrators to securely exchange email with their payroll provider. 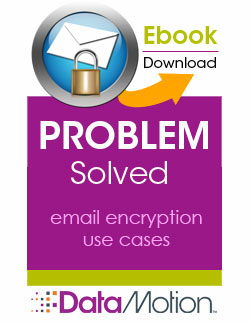 No encryption keys need to be managed, and the payroll provider does not need to have SecureMail installed. Administrators can easily see when a secure email was sent, delivered and received. Time consuming follow up calls are no longer needed and days can be cut from the process saving the institution time and money.